Here is another is another Christmas decoration I made for my home using the Decor Elements Blocks and the Holiday Mix Decor Elements found in the Stampin' Up! Holiday Mini Catalog. 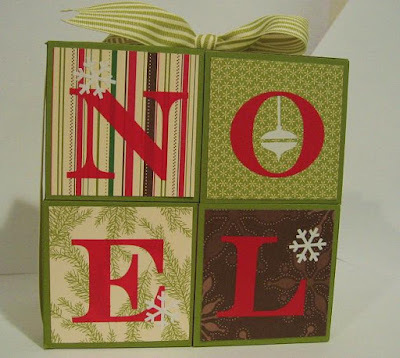 I used the Merry Moments double sided paper ( from the Stampin' Up! Idea Book & Catalog ) and Old Olive cardstock to cover the blocks first. To finish the project, I wrapped Old Olive striped ribbon to hold the blocks together. This sits on a bookcase in my reading room. Make Stampin' Up! your one-stop shop for all your holiday gift-giving needs. With our Gift-Giving Guide you can quickly and easily find gifts for kids, teens, neighbors, and more! Plus, get a FREE Décor Elements (up to a $16.95 value) when you spend $50 on products in the GUIDE.